If you've got a long day ahead of you, this substantial but easy-to-prepare meal is just the ticket to make sure you eat well. 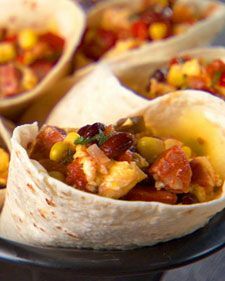 And if you know things will be busy, these breakfast burritos can be set up the night before and made in 10 minutes or less the next morning. From the book “Mad Hungry,” by Lucinda Scala Quinn (Artisan Books).